"C.W. Brooks Presents Items Abandoned by W.C. Richardson (8/28/2014 and 9/3/2014)"
​This piece began as a collection of items left behind by Professor W.C. “Chip” Richardson in my University of Maryland-College Part studio in the fall of 2014, my first semester as a student in the UMCP Fine Art MFA program. These items were tagged and stored without plan or concept. In the fall of 2015 I learned that there was to be a show of UMCP faculty work in The Art Gallery, a large gallery on the second floor of the Art/Sociology Building (now Parren Mitchell Building). It was not until early October, 2015 that I came across a reference to a work by Robert Berry (“Robert Berry Presents Three Shows and a Review by Lucy Lippard”) which finally tied the objects together conceptually. Once these things came together in my mind I immediately drafted and sent an email to Taras Malta, Director of The Art Gallery, and to W.C. Richardson, who was the current Chair of the Art Department, requesting consideration of inclusion of the piece in the faculty show. Although I was a graduate student, I felt this a reasonable request as the items presented were those of W.C. Richardson, who was a faculty member. Unfortunately, there was no reply from the gallery Director and the Department Chair seemed to feel the request to be some kind of joke, so no offer of inclusion was forthcoming. Lacking inclusion in what was unquestionably the most appropriate venue for this piece the decision was made to display the piece in the lobby of The Art Gallery for the length of the UMCP Faculty Show. A pedestal was acquired, a vitrine constructed, and the piece was prepared for display. During the opening on the evening of November 4th, 2015 the piece was installed with the kind assistance of fellow graduate student ████████ and lecturer ██████████. Within a week W.C. Richardson attached the award of “Best in Show” to the piece. 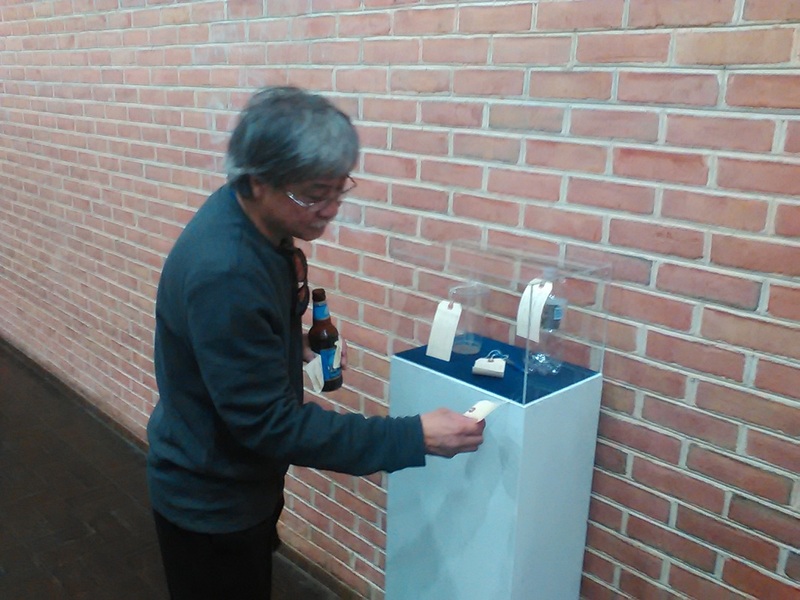 Professor Foon Sham enjoys the piece? An unhelpful graduate student and lecturer view the piece.